Sending prayers with my family SkiZero, Canyon, Shawna and Patience! Painting in Solidarity with Standing Rock Sioux Tribe and The Sacred Stone Camp in North Dakota protecting sacred rivers and sites from a oil pipeline that threatens their future. Also bringing water awareness to our Mesilla Valley Community! Good times traveling with the fam in our beautiful state! Thank you Native American Club of Western New Mexico University in Silver City and faculty that helped to create a presence of Indigenous Spirit in and around this institution. We had a great time inspiring the creative nature in all of us! Shout out to my dude Vicente Partido for taking the time to write this article! I was actually raised in Farmington, New Mexico and come from both Navajo and Jemez roots. Blessing and love to my family preparing for feast day tomorrow! We’ll be thinking of you! Honored to be apart of this monumental HipHop event in Las Cruces, New Mexico! Honored to be curating this #ArrowsoulArt event that will give create his and her stories in the city of #lascrucesnm. The power of color will be unleashed on the public Friday May 1st 2015 @westendartdepot 5pm. With #Homegrownm #NewMexico artists #NaniChacon #JayceeBeyale #RepOneTWS #KillaCamTWS Followed by a #Livepainting Showcase Saturday May 2nd 9am at the Branigan Cultural Center and Las Cruces Museum of Art. What happened on this weekend…. On Friday May 1st my brother Jaycee Beyale made it to Las Cruces, New Mexico. With a plan in order to start the initial layout of him and Nani Chacon’s mural design. They were both scheduled to showcase and paint a mural for an event titled “Pictograff” at the Branigan Cultural Center. An event I was contracted to coordinate. 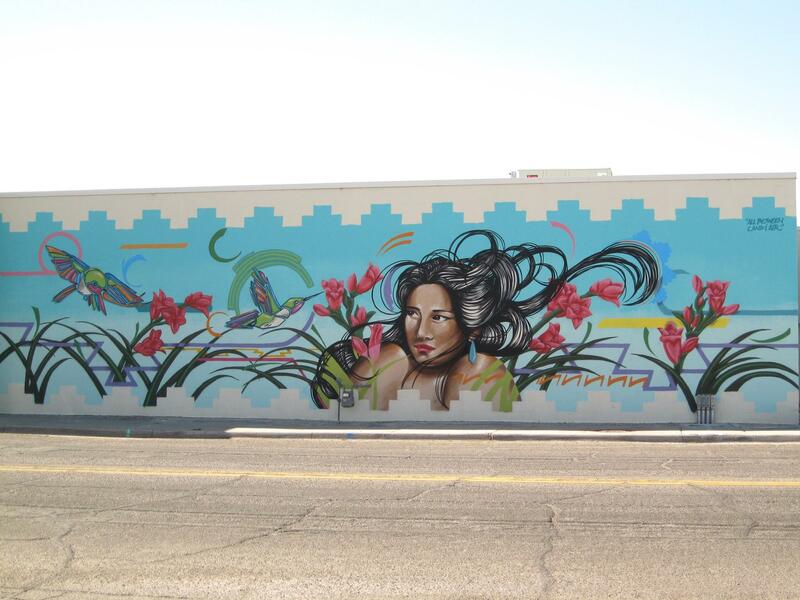 With stipend I decided to fund more paint and find a privately owned wall located in the heart of Las Cruces. I wanted to bless the people with a full size cultural piece from 2 of New Mexico’s most respected muralists, Since we will be hosting them for a few days. I knew we would be able to finish 2 murals in 2 days with Aerosol as the medium. While painting the background on Friday morning the workers from the Las Cruces visitors bureau arrived to find us beautifying they’re building. Seems the building owner, whom I had received permission from days earlier had become ill and was unable to relay message to tenants that we were to begin mural immediately. Therefore began to threaten us with vandalism charges and calling us criminals. Saying we had no permission to paint on a city run business without the proper juried “branding” process. Stating this mural has no significant reflection of the Las Cruces community. During commotion the local newspaper caught wind that the city might be painting over the mural. Ran the story and in two days I say about morethan half of the Las Cruces population came out in support of the mural and flooded social media with positive and negative feedback of “Public Art” and why they want the mural to stay. We as artists did not expect this whole hurricane would come out of applying paint to a wall. At time we were unsure of ourselves and felt like we were not going to finish this project but continued to push thru the heat and with help from the community and a simple visit from a local elementary school we gathered all the energy needed and won the battle between Art & Business.